• Zach Randolph makes just $17 million a year playing basketball, so naturally he supplements his income with a second job as a "a major marijuana supplier in Indianapolis." 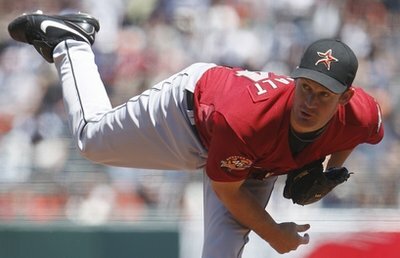 • My take on Roy Oswalt is that he'd probably be too costly for the Twins. Steve Phillips' take on Oswalt is that the Nationals should trade Stephen Strasburg for him. Seriously. • After reading this story, I'd advise Joe Mauer to avoid any suspicious-looking twins. • Daunte Culpepper will be reunited with Denny Green in something called the United Football League. Sounds about right. • 50 Cent looks scary after going from 214 pounds to 160 pounds for a movie role, but I'm still jealous. And it annoys me when someone who's in fantastic shape to begin with can so easily shed weight. • Bob Davidson furthered his reputation as one of baseball's worst, most combative umpires this week. And yes, I know he's from Minnesota. He's still a terrible umpire. • Speaking of umpires going out of their way to find confrontation, Joe West was on a mission to mess with the White Sox on Wednesday. Mission accomplished, I guess. Ozzie Guillen then earned himself a big fine by speaking the truth afterward. Obviously no one likes it when umps blow calls, but for whatever reason that doesn't bother me nearly as much as when they seek out confrontation (although usually that's in conjunction with a blown call). It sounds like West will be disciplined by MLB, at least. • An interesting contrast of managerial personalities was Guillen calling West "a f-ing a-hole" while Brewers skipper Ken Macha complained about "negativism" and "poppycock." • This picture says a thousand words and all of them are "Ron Swanson is awesome." • On a related note, this news is the opposite of awesome. • I've linked to him before, but Joe Posnanski's brother Tony Posnanski has lost 221 pounds. If you're like me and are always looking for weight-loss motivation, check out his blog for the amazing progress in picture form. As for me, I'm holding steady at around 70 pounds lost due to a few dieting slip-ups this month. For me the two biggest struggles are avoiding boredom while exercising and avoiding the seemingly random urge to eat a whole bunch of bad stuff. • In related news, Pizza Hut's honey BBQ "bone-out wings" are really good even if they aren't really "wings." • Drew Magary also has some helpful (and very funny) dieting tips. • I'm probably just bitter because I've been doing this for eight years and have made almost enough to buy a Luis Rivas rookie card, but the notion that someone might pay $20 million for Perez Hilton's blog makes me want to shut down the internet. Or maybe start blogging about Lindsay Lohan rather than Delmon Young. • Do you think Amar'e Stoudemire ever confuses Robin Lopez for his mother? • David Brown of Yahoo! Sports was in town this week and wrote an amusing review of his first trip to Target Field. • I'm looking forward to the inevitable moment when the Target Field hawk attacks the Target Field squirrel, if only for Brendan Harris' reaction. "Do you find this fun and interesting?" • Maybe the Twins could do something like this, but with Anthony LaPanta instead of Elvis? • I'm a huge Lost fan, but because I didn't start watching the show until last year and blitzed through the old episodes in the span of about a month my time devoted to the series is lower than most. With that said, I thought the finale was good without being satisfying, although in fairness people seem to overestimate the number of truly excellent series finales in television history. I'll definitely remember the characters and acting more than the mythology. Actually, the thing I'll probably remember most about Lost is the pilot episode that ranks as my all-time favorite (and not just because of the "Kate bathing in the ocean" scene). No show has ever hooked me so thoroughly with a single episode, although re-watching the pilot on ABC the day before the finale was a totally different experience and it actually struck me as sort of quaint. My favorite quote from the finale: "It's a helluva long con, Doc." • Oh, and as an MMA fan I also enjoyed Jack's odd attempt at a "Superman punch." • At this point I'll be shocked if the Moneyball film is even decent, with Jonah Hill playing Paul DePodesta, Philip Seymour Hoffman playing Art Howe, and Robin Wright playing someone who didn't actually exist in the book. • Gus Johnson taking over as the voice of the Madden video game franchise may convince me to finally buy a Playstation 3 after years of letting my Playstation 2 simply collect dust. • R.A. Dickey wasn't much good for the Twins last season, but the 35-year-old knuckleballer tossed six shutout innings for the Mets this week after being hit on the elbow by a line drive. - Are the Phillies overworking Roy Halladay? - Jake Peavy has a 6.05 ERA and a "tired arm"
Should the Twins trade for Roy Oswalt? Roy Oswalt requested a trade from the Astros over the weekend and judging from the e-mails and tweets I received on the topic many fans are wondering if the Twins should pursue a deal for the 32-year-old right-hander. Oswalt has been one of baseball's elite pitchers for a decade, yet generally seems underrated for someone fourth among active pitchers in ERA and winning percentage while winning more games than everyone his age or younger except CC Sabathia. He's started at least 30 games in seven of the past eight seasons while posting an ERA above 3.55 just once during that span, yet is only a three-time All-Star and has never finished higher than third in the Cy Young balloting. Last year back problems limited Oswalt to fewer than 200 innings for the first time since 2003 and he posted a career-worst 4.12 ERA, but he's been as good as ever this season with a 2.66 ERA and 60-to-16 strikeout-to-walk ratio in 61 innings. One of the issues for the Twins in terms of possibly upgrading the rotation is that they already have five solid starters, and while not all of them have performed as well as hoped early on in 2010 there isn't an obvious Ramon Ortiz or Sidney Ponson or Livan Hernandez to jettison. In other words, it's tough to trade a mid-level prospect or two for a Carl Pavano type when you already have the actual Pavano and a rotation full of similarly solid but unspectacular pitchers. If the Twins want to legitimately upgrade the rotation they'd have to target an upper-echelon starter, which brings up two other issues. First, those guys tend to be very expensive in terms of both salary and cost to acquire. Beyond that, unless one of the current starters is part of the trade package for that upper-echelon guy a deal would involve dumping someone from the rotation who doesn't really deserve it and is a perfectly good big-league starter. As for whether Oswalt fits that upper-echelon bill, the answer is a pretty clear yes even if he's just as clearly declined some from his prime. Beginning with Oswalt's first full season in 2002, he's ranked 4th, 15th, 13th, 13th, 9th, 25th, 11th, 26th, and now 8th among MLB starters in Expected Fielding Independent Pitching, which removes factors like bullpen and lineup support, defense, and luck from the equation to evaluate pitchers based strictly on things they control. Some of Oswalt's advantage over the Twins' current starters is definitely due to his pitching in the much weaker league, but I feel safe in saying he'd be a clear upgrade and likely the team's top starter (depending on Francisco Liriano's progress). However, the Astros would no doubt demand several of the Twins' top prospects in return for Oswalt and he's making $15 million this year with another $16 million in 2011 and a $16 million option or $2 million buyout in 2012. While around $26 million for 1.5 seasons or $40 million for 2.5 seasons is essentially the going rate for a true No. 1 starter, even with the new ballpark boosting revenue higher than ever the Twins seemingly aren't in a position to add another big salary given their commitments to Joe Mauer, Justin Morneau, Joe Nathan, Michael Cuddyer, Scott Baker, Nick Blackburn, and Denard Span, plus upcoming arbitration-fueled raises for several other players. There's zero question Oswalt would be an upgrade and his remaining contract is more or less commensurate with his skills, but it's not that easy. Is he better than, say, one of Blackburn, Baker, or Kevin Slowey plus two top prospects and $30 million? Because in trading for Oswalt the Twins would also be dumping one of their current starters from the rotation, giving up at least one and perhaps multiple highly rated prospects, and taking on the rest of his deal. Without knowing the Astros' demands it's impossible to say for sure, but those factors would make me think twice about a move and my guess is Oswalt's contract alone takes the Twins out of the running. Oswalt is an outstanding pitcher with gas left in the tank, but between the costs to acquire him and lack of an obvious rotation weak spot pursuing him doesn't seem to be a great fit unless the Astros like Slowey, Blackburn, or Baker as a major part of the deal.